Anyone following my build thread knows I'm on the hunt for some serious tires. I've asked advice from CherokeeForum on what kind of tires I should run, but I'm still at square one (they gave great input, but I'm still struggling to make a choice). Maybe Expedition Portal Jeep peeps can help me with this. I'm looking for a moderately aggressive-looking ALL-TERRAIN tire. I would like to run 31's, but wouldn't oppose 32's if I came across them. My XJ is primarily a Daily Driver, but sees trails and hills on the weekends, and will be doing some off-road exploring as New England warms up for the late Spring and Summer. 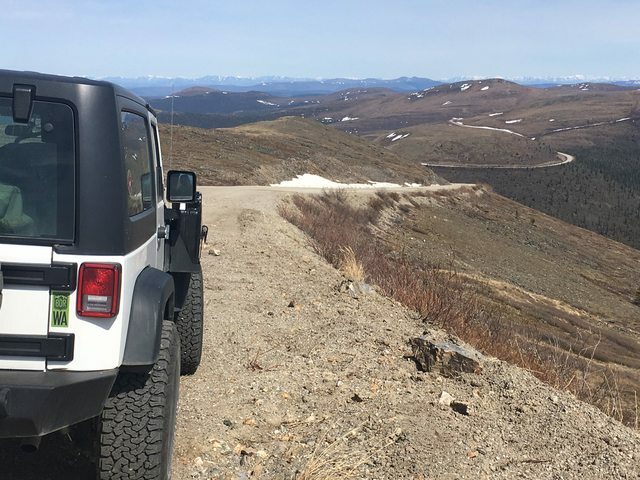 Therefore, the tires should be able to perform quietly on the road and highway (or at least not hum to the point of drowning out my radio) and be able to make it through light-moderate mud, dirt, and some rock passes. Lastly, I'm looking for longevity. I'm not expecting to bang 60k out of a set of tires, but I'm hoping to score a set that reasonably wears over time instead of within a year or two. Price is not a factor in my decision, I just need the bang for the buck here. Also, we New Englanders face mean winters. Snow and ice leaves sedans and trucks sliding across city streets. As I plan on off-road adventuring in the winter too, I need something relatively good in snow and ice. Now I understand this sounds like the holy grail of requests here, but I'm not looking for the perfect tire. I just need some worthy suggestions so that I may do some research, and it would be awesome to hear honest reviews for you all if you have a set you swear by. Which All-Terrain tire is quiet-enough on pavement, can handle some light mud and rocks, grips well in winter and will not wear in a year? Please help a novice adventurer out. Cooper ST-Maxx is the best I've used for what you're describing. Honest to God, about five minutes after posting this I started scouring the site for other threads like this - everyone is recommending Cooper ST-Maxx. What size rim are you planning on running? I am thinking of running a 16" rim, and don't necessarily need the snowflake stamp. in the st maxx you can go with a 255/85r16 had them on my sequoia and they do fantastic in the snow , not as good in the ice till I got them down to 15 psi . they are a tough tire only downside is they are heavy . What kind of snow do you guys typically have their do you have the soft fluffy powder snow or the wet almost Frozen slushy ice sort of snow? The ST Maxx's are great tires, but I'm going to say BFG AT's. I had a set on my old Jeep and they did just fine off road, but had good highway manners and wore very well. I have the Cooper's right now on a Taco and while they're better off road, they're noisier on road (at least after they get some wear on them) and don't seem quite as good in snow. The sorry I just saw the thing about snow and ice the reason I ask is you have to take people's opinion with tires in the snow with a grain of salt because what one personal say is a fantastic Tire in the snow might be in one of those areas that gets that nice soft fluffy snow but then the tires horrible in the ice and I'll give you a really good example. Now this was before I put the Coopers on my Sequoia but it's the same trip two days apart both at 15psi. So when someone tells you it's tire is fantastic in the snow you have to make sure they're driving through the same conditions you will be. Fantastic, thank you all. In MA, our snow can be fluffy and aggravating but it is mostly kinda hard and relatively icy in spots. It depends really on the storm prior. And yes, I take it with a grain of salt - you're absolutely right. Also, what will having heavier tires do in the long run? I can't say I've ever run a set of heavy tires. Is it just decreased mpg and louder noise? Am in the Northwest, not the Northeast... Caveat mentioned at the start. Treated my JK to a set of BFG KO2 All-Terrains a year ago. Have 14,000 miles on 'em now, and I honestly think they're the best all-terrain tires I've ever used. This is far from my first set of BFG All-Terrains, but these are even better than in the past, on and off-pavement, and yes, in snow and on ice as well. I have not yet used the Coopers, so I can't compare the two by personal experience. From what people say about them, the Coopers are excellent as well. My BFGs have taken me to Fairbanks and back, about 4,500 miles. Recently returned from a trip through Utah and Arizona, about 3,600 miles. And I do a lot of running around here in the Northwest, since I live right on the edge of the Cascade Mountains. Snowy conditions here last winter, and the BFG's did very well. Honestly I think you'd be well served by either. The newer All-Terrain designs are terrific all-around tires. I vastly prefer them to mud tires, which I've also used in the past. The mudders did really well in some off-pavement situations, but... I wasn't as happy with them for all-around use. Not so much an increase in road noise but yes you will lose some MPGs with a heavier Tire because it takes more power for your motor to rotate the mass of it. I ran a lot of different tires and love we land in the snow and I can tell you from personal experience you cannot get a better all-around tire than the BFG ko2 although I am very much wanting to try the Falken wildpeak a W3 my buddy has them on his Rubicon and that thing will go places you shouldn't be able to with all-terrains plus they have the deepest tread depth of any all-terrain tire but again they are kind of heavy. And the only thing the severe weather stamp does is tells you to pass the Federal regulations for turning and stopping on ice. I love BFG AT KOs as well. Practically bomb proof. They are not a great mud tire, and for me they are too hard for really icy conditions. Great in the snow if not icy. I had to trade them out for Duratracs after nearly sliding off an icy road to the ski hill. The Duratracs are also a good all-condition tire, but I don’t like the highway manners as much (too much bounce/soft sidewalls like Michelin’s.